This is the pitiful sight that greeted me when I arrived to rescue Cake. 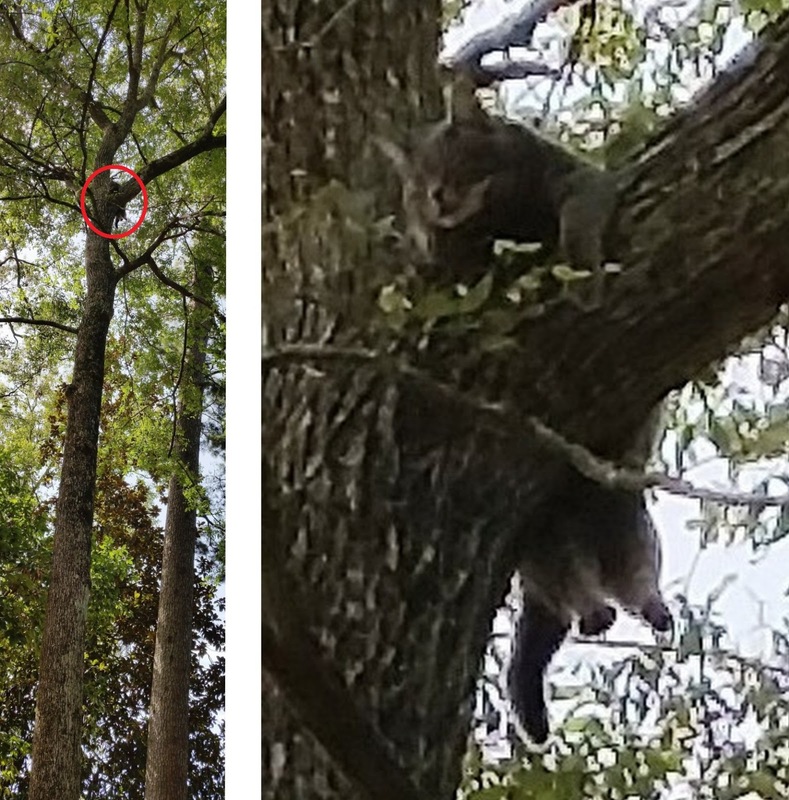 This sweet boy had been in the tree for four days and was so exhausted that all he could do was drape himself over the branch and wait to die. He didn't even move his head to watch me below; he moved only his eyes. Seeing him dangling there just broke my heart. Unfortunately for Cake, this turned out to be my worst rescue performance ever. In all my tree climbs, whether rescues, practice, training or fun climbs, I have never dropped anything that I did not intend to drop. But on this one rescue I dropped three things: a can of his favorite treats, my rescue-pole, and, worst of all, Cake. Cake survived the fall just fine and is doing very well, and while the fall was substantial, it was not as far as it appears in this picture. He landed on soft ground and immediately ran off to hide. Still, this was a bad day for me. I had been told that Cake was skittish with strangers, so I knew it was unlikely that he would be receptive to me. While he was obviously exhausted, I could not count on his staying docile because adrenaline could fully energize him very quickly. 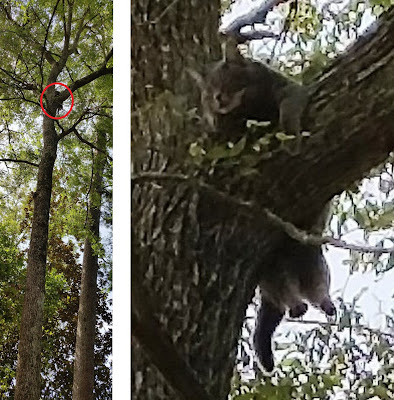 Indeed, when I shot my throw line into the tree to set my climbing rope, he nervously got up and walked halfway out on the long branch he had been on. Fortunately, he plopped himself down there, again dangling all four furry legs, and didn't move from there for the rest of my climb. When I reached his branch, I shook his can of favorite treats. His ears and head moved in recognition of that familiar sound, but his body stayed put as I expected. He was not going to voluntarily come near me. As I re-positioned myself on the branch, I accidentally dropped the can of treats, but did not even know it. I would not need them anymore, but still I should not have dropped them. Drop number 1. 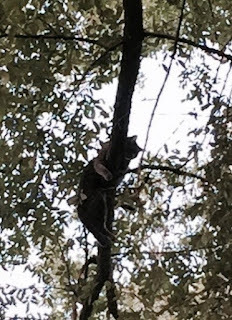 Cake had positioned himself about 15 feet out on the branch that I am standing on in this picture, and I could not get much closer to him because I had no good place over that branch to which I could tie myself. 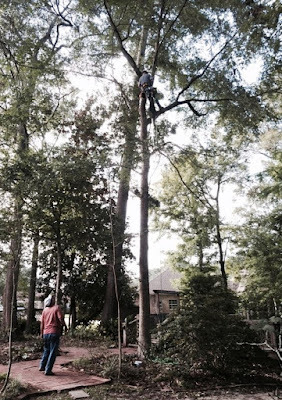 There were two limbs sticking out of both sides of that branch where he was sitting that prevented me from using the net, so the only option I had at that point was to use the rescue-pole. I had my long rescue-pole dangling vertically below me, and I somehow managed to drop it. It hit the ground in that vertical position, and I had to ask the family below to attach it to my line so I could pull it back up. Drop number 2. My rescue-pole is extendable, and for this case I needed to extend it to at least 10 feet. When I attempted to do so, I found that I could not budge the extension. The fall had damaged the pole in some way that I could not extend it anymore. I tried and tried, but it just would not go. It still functioned properly, but it was too short to use at that length. Using all my strength, I finally managed to extend it a couple of inches. Then I managed a couple more inches. Eventually it became loose and I could now extend it to the length I wanted. I tested it to be sure it was functioning properly, and it was. Cake was facing me, and I wanted to make sure that he did not go any farther on that branch away from me. I decided it would be best to get the noose around him from the back so that if he ran away from the noose, he would be coming closer to me. Since his legs were dangling, I thought it would be fairly easy to get the noose under one back leg and then the other. He was remarkably calm and unaffected by the noose touching him, but he did react by tucking his legs in. So I approached him from the front instead. It is almost impossible to get a noose under a cat that is lying down, so I used the noose to tug on him slightly to get him to stand a little or to at least move his front feet forward over the noose. He did exactly that, and I was pleased that I had so quickly positioned the noose in the proper place directly behind his front legs. I tightened the noose and lifted him slightly to force him to walk along the branch toward me. That did not work well, so I lifted him. At that point he slipped out of the noose, and my heart sank as I helplessly watched him fall down to the ground flat on his belly with a loud thud. Drop number 3. He immediately ran off and hid under the pier at his house. I told the family to leave him alone and let him hide until he felt it was safe to emerge. They watched him and saw him sitting under the pier looking around. They gave him some water, and he came out from under the pier walking with a slight limp. After an hour or so, however, he was back to his normal self and no longer limping. Cake's family was so relieved to have him down. They were so kind, gracious and appreciative for all that I had done, yet I felt like I did not deserve their gratitude. I felt like I had failed them, and especially Cake, by dropping him like that. Every time someone calls me for a cat rescue, I make a point of explaining how risky the rescue can be. I explain that I could even drop the cat, but I was always proud to add that I had never dropped a cat before. I can't say that any more. Cake's family sent this picture to me showing Cake just two hours after his fall. 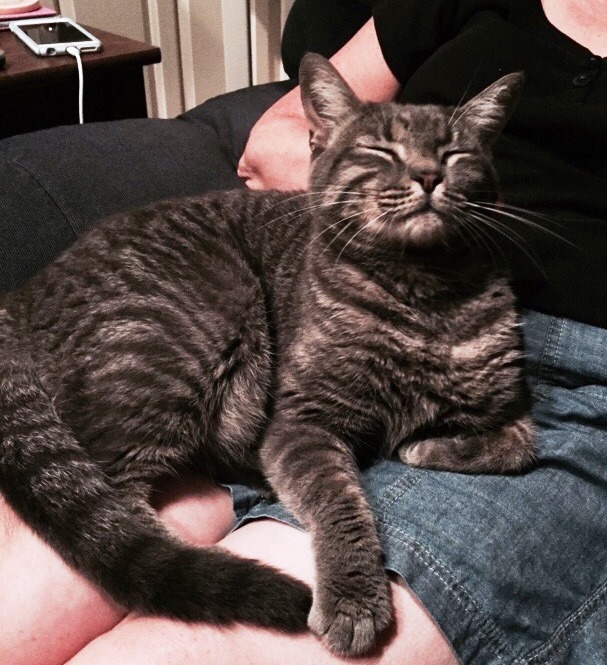 He is still doing fine and is happy to be back home and in his mama's lap again.